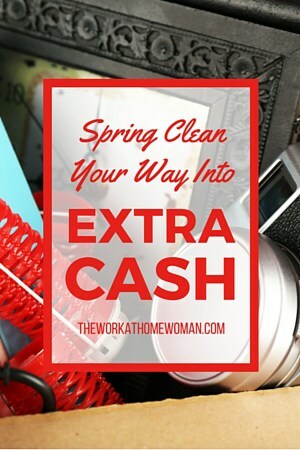 Spring Clean Your Way into Extra Cash! 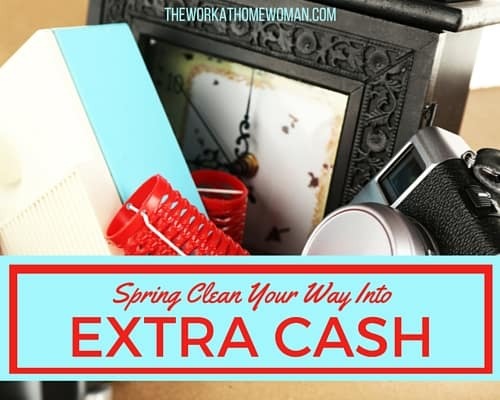 You are here: Home / Money / Spring Clean Your Way into Extra Cash! Spring has sprung, and many of us are experiencing the need to purge our homes. It always amazes me when I do a deep clean and organization binge on our house. For someone who tries not to buy unnecessary items, we sure do always seem to collect them! I always feel such a mental relief when I create more space in our home. Clutter is something that can create a lot of anxiety, especially when you live and work in the same place — which is at home for some of us! You can make some decent cash on items lying around your house. From gently used or brand new clothes that you’re never going to wear again to your kids’ neglected, outgrown toys: Almost everything has a potential value to someone. One of the most well-known ways to sell your items by yourself is through eBay. The thing I love about eBay is that anyone can sell there. If you’ve never sold on eBay before, no worries. It’s not complicated. If you were able to find this post, then you have enough skills to learn how to sell on eBay. 90s hammer pants are a big hit on eBay. Old(ish) coffee mugs from Starbucks can also bring a pretty penny! Sometimes, the more bizarre and outdated an item is, the more profit it will bring. There’s a well-known saying around sourcing at thrift stores, and that is, “The uglier, the better!”. If you have kids, then you probably have a load of toys that have been buried and forgotten. Good news — they probably won’t miss them, and you could also make a tiny fortune from them on eBay! If you aren’t sure if a certain toy is worth anything, just do a quick search and look your item up on eBay or Google. You might be surprised as to what some of these can sell for! New and old electronics are always in demand. Some are worth thousands, and some are worth absolutely nothing. Luckily, it only takes a few seconds to search for the value of an item on Gazelle to determine whether it would be worth your time to sell it. If not, it could always go on in the “donate” box. If selling online isn’t your thing, you can still make money on your items. A good spot to go to for selling larger items, such as furniture, is Craigslist. Or, you can join a couple of local garage sale groups on Facebook. There are a few selling apps that can be downloaded to your phone as well. Apps are a fast way to sell your items because it eliminates the process of uploading photos. My favorite app to sell on is Mercari. You can sell almost anything on their app, and I have had only great experiences with it. Another app is called VarageSale, which is for local sellers and buyers only. You sell your items as “pick-up only”. Both of these apps are extremely user-friendly and make it fast and easy to make extra cash! I have used Mercari far more than I have used VarageSale, but I have heard wonderful things about both. Poshmark is another app in which you can sell items. Poshmark is strictly for selling and buying clothing and accessories, though. They are also very easy to use, and I have made a few sales with them as well. Your trash can definitely be someone else’s treasure! So start cleaning and earning some extra money! This page includes some affiliate and referral links. Please be aware that we only promote advertising from companies that we feel we can legitimately recommend to our readers. Please see our disclosure policy for further information.